It was the worst of times. With the wet spring and summer it was a very good year for amphibians in Western Canada but it wasn’t all great news for them. Each morning I would find many of them squashed on the roads, particularly in Banff National Park. They were too mutilated to be able to ID, but on one of the late nights returning from photographing the night sky I eventually came across one that was alive and well. It was a western toad; a species of “special concern” under the Species At Risk Act (SARA). I pulled over to the side of the road and got out to take a few photographs. While laying on the road to get the perspective I wanted, a couple with a truck and camper came around the corner in the opposite direction. 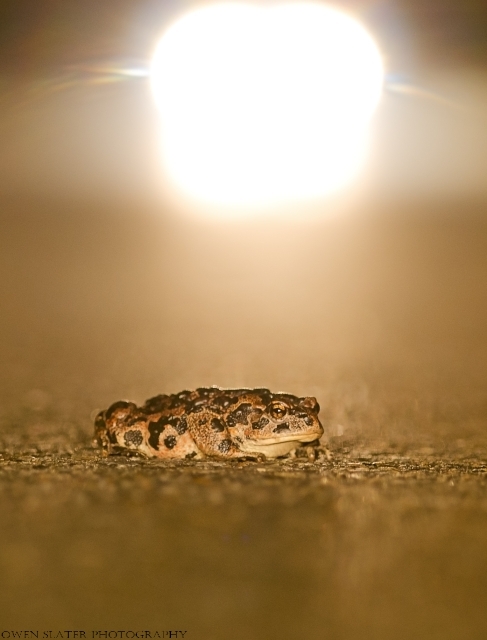 I used the opportunity to take a photograph that tells the fate of many of these toads on the roads this year. However, I didn’t anticipate the reaction from the people in the vehicle! As they passed by they must have looked down and saw me laying on the road directly in front of my parked car. I assumed they saw me photographing something and wondering what it was I assumed they started backing up in my direction to find out what it was. I continued taking photos until they were right beside me, at which point I got up. Almost immediately the driver yelled at me that I had just given him the scare of his life! He explained that he thought there had been an accident, that I had been hit or thrown from my vehicle and that he thought I was dead on the road! I apologized several times, but I think he was still in shock because he kept repeating the same refrain. I apologized once more before he slowly drove off towards the campground shaking his head. Not wanting to cause any more concern, I quickly coaxed the toad off the road, got back in my car and drove away. 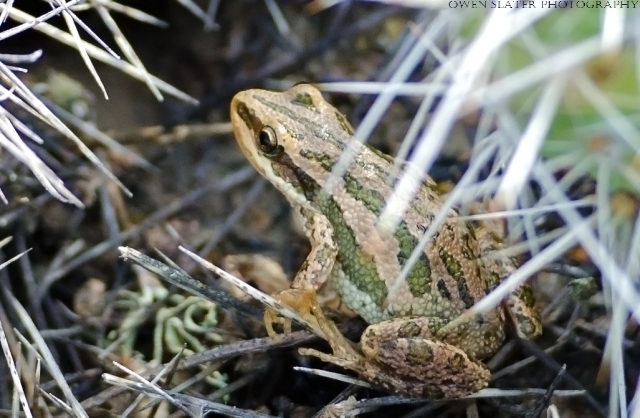 This little chorus frog (no bigger than a few centimeters) saw me coming while on my search for short-horned lizards and fearing that I might be a predator, headed straight for cover by hopping into a cluster of prickly pear cactus plants. Flirting with disaster, it easily maneuvered itself between the spikes in a perfect defense strategy for most would be predators. I quickly snapped off this photo and then left it be so that it could carefully extract itself from the precarious situation.